Dynafit filled in the void between their popular Titan and TLT series with the Khion Carbon. 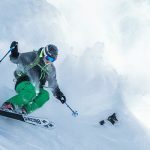 Combining legitimate power of a four-buckle freeride boot with a stellar walk mode, the Khion maximizes downhill chops with fleetness of foot in a lean, muscular package. To be honest Dynafit actually went in a slightly different direction than their TLT series and made a formidable option that is more reminiscent of their successful Titan boots. Carbon mapping along the sides bolstered the power transfer when a started a turn, which provided maximum control (and satisfaction) through the deepest part of a long radius arc. The boot also provided immediate lateral responsiveness while picking through crap conditions during a high-pressure siege at Jackson Hole. The immediate standout was the 102 mm boot last. The Khion boot volume is a total departure that what is customary for the notoriously svelte Dynafit line. If you’ve stayed away from Dynafits because they traditionally have very narrow lasts, then consider the Khion, as this shell offers a completely different shell volume experience. At ground level, the walk mode and sole combination provided very responsive feel while moving over talus and scree on out of bounds forays. 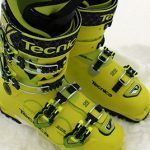 This boot belongs in the good company of the Scarpa Maestrale RS and Salomon Mtn Lab. The high-strength magnesium spine is tough and, matched with an aggressive forward lean, locked legs into position and prevented any chance to fall into the back seat—a common pitfall of semi sturdy AT boots that try to balance ergonomics with downhill chops. Despite some bias against the Boa Closure system in ski boots, the liner was comfy from the get go, and did the job just fine. Testers wished they’d been able to try a pair of Intuitions in them. The buckles are a bit catchy, meaning they are finicky when manipulating them with gloved hands. You can save $100 and 1oz. with the non-carbon version.